ESTERO, FL - Martin Ouellette stopped 18 of 19 shots to help place the Florida Everblades to a 3-1 decision over the Orlando Solar Bears Friday night at Germain Arena. The Everblades earned their seventh consecutive victory and extended their division lead to seven points. The 'Blades struck first just past the midway point of the first period. While on the power play, a faceoff win allowed for a nice setup at the point from Mitchell Heard who sent the puck down low on to Stephen MacAulay below the circle. MacAulay delivered a quick pass to the slot found John McCarron ready for a shot that he sent past the glove of a frozen Mackenzie Skapski. The Blades and Solar Bears headed into the intermission with McCarron scoring the only goal of the period, giving the Blades a 1-0 edge. Jimmy DeVito extended the Blades lead 7:54 into the second period when he was hit on a perfect pass from Logan Roe in the Blades end that sent DeVito blazing in his fire-printed Guns 'N Hoses jersey on a breakaway. DeVito made a head fake and lifted the puck past Skapski's glove to give the Blades a 2-0 lead. For DeVito, it was his first point and goal since joining the Everblades in a trade last week with Reading. Matt Berry added Florida's third goal to the board with just 21.6 seconds left in the second period. Berry entered the zone trailing Spencer Smallman who dropped a pass to Berry in the circle who curled and sniped the puck past Skapski's blocker for the goal. Martin Ouellette in his second game as many nights, came up with a huge save for the Blades early in the third period. Jean Dupuy received a cross crease pass and fired it towards Ouellette, but Ouellette flew across his crease with his blocker high in the air to bat away the Solar Bears best chance of the game. 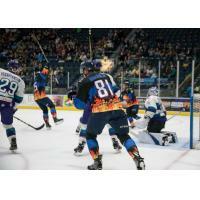 The Solar Bears broke Ouellette's shutout with twelve minutes to go in the third period while on a power play. Max Novak picked up the goal for Orlando with a clapper from the top of the circle that snuck through traffic and Ouellette, cutting the Blades lead to 3-1. The 'Blades found themselves in penalty trouble with 9:20 to play in the third when two slashing calls put them on a 5-3 penalty kill for 39 seconds. Florida killed off both penalties, as both teams finished 1-for-9 on the power play in the contest. The Solar Bears pulled their goalies with 1:19 remaining in regulation. With the Solar Bears unable to set up a real zone presence in the offensive zone, the time trickled off the scoreboard and the Blades took their second win in as many nights with a 3-1 score. Martin Ouellette picking up his 27th win of the season, as he put away 18 of the 19 shots he faced. Skapski takes the loss allowing three goals on 32 shots. Game Notes: Mitchell Heard extended his point streak to eight games with an assist on the power play... Rookie blueliner Derek Sheppard finished a +2 in his Germain Arena debut. The two teams will meet again on Saturday at Germain Arena at 7:00 p.m. The annual Guns 'N Hoses game featuring local police and fire fighters will begin at 4:15 p.m. Full promotional details for Saturday is listed below. Saturday, March 17, vs. Orlando, 7:00 p.m. Annual Guns 'n Hoses game! The team will wear special police and fire fighter themed jerseys that will be auctioned off following the game to benefit MDA (Muscular Dystrophy Association). In addition, local police and fire fighters will do battle on the ice beginning at 4:15 p.m. Try Goalie Day also takes place on March 17 from 12;30-2:30 p.m. on the main rink at Germain Arena. This FREE event is open to youth hockey players aged 5-13 interested in the opportunity to try playing goalie. Everblades Goaltending Coach Josh Robinson in conjunction with Phil Osaer with USA Hockey will be hosting the event for interested youth players to have fun and give the goalie position a try. Goalie equipment will be provided, but interested players should bring their own hockey equipment and skates. SPECIAL OFFER! Purchase a new ticket package for the 2017-18 season and receive a $20 gift card to Ford's Garage!